Introducing the Fendi Kan I Bag. This new bag is from the brand’s Resort 2017 Collection. The Kan I is a small flap..
Fendi introduces Fur Trimmed Bags this Fall 2016. The brand‘s iconic 3Jours and Peekaboo Bags gets a fun update with mink fur trim.. Introducing the Fendi Faces Backpack Bags. Fendi’s newest design is part of the Men’s Fall/Winter 2016 Collection and was first seen during the.. Introducing the Fendi Fashion Show Peekaboo Bag. This new Fendi Peekaboo Bag was first presented during the Spring/Summer 2016 runway show. The.. Introducing the Fendi Lei Selleria Bag. 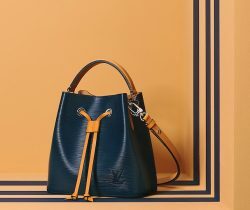 This newest bag from the Fendi Selleria line is made of Cuoio Romano leather. A Boston bag,.. Introducing the Fendi Double Micro Baguette Bag. This bag was first seen during the Spring/Summer 2016 runway show. The Double Micro Baguette features..
Fendi introduces a new mini size for the iconic 3Jours Tote Bag for their Resort 2016 Collection. Although a mini size was released back..